I think the secret to always having a clean house is definitely staying on top of things! 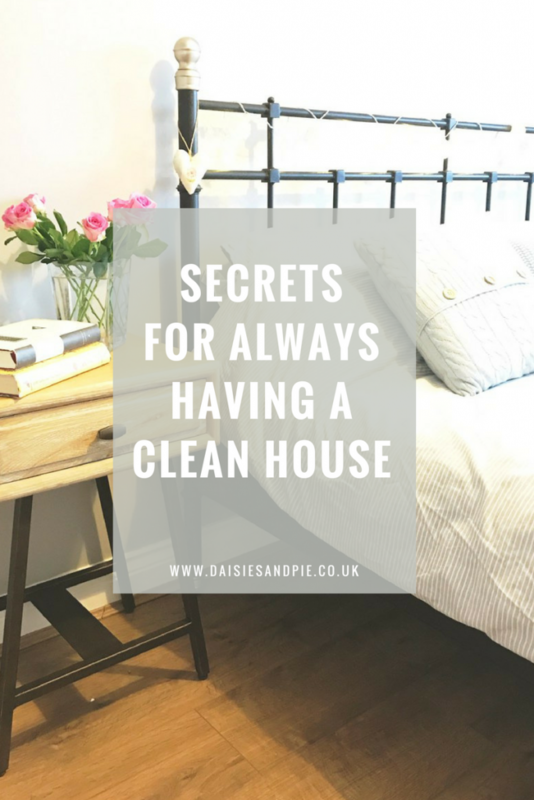 I’m sharing the little things I do everyday around the house that help to keep it clean and tidy and nice to come home to. Always make the beds. Throw open the bedroom windows wide whilst you do it and freshen up the bedroom. Nobody wants to go to bed at night to be greeted with messy unmade sheets. It’ll take you less than 5 minutes to get that bed made and looking lovely. Always wash the pots/stack them in the dishwasher. That way when you come home or get up in the morning, it won’t be to a pile of dirty dishes. Urgh. Do this at the end of every day, after you clear up from dinner. It keeps you on top of the housework, it keeps the kitchen clean and hygienic and fresh. Be sure to wipe up spills as you go along too, this will save you spending a day scrubbing sticky cupboards or fridge. At the end of the day, wrap up the rubbish and recycling and take it out to the bins. It’ll take 5 minutes and it will keep your home fresh and clean. Deal with mail and school letters/emails as they come in, don’t stack them in a pile or push them into a draw to sort out another time… by the time that day comes it’ll be a full on task. It takes only a couple of minutes to answer letters/emails, and sort out requests from schools. Try to open all your windows for a least an hour a day, even in cold weather – just to change and freshen up the air. Helps to rid the house of cooking smells and stale odours too. Do a quick vacuum of high traffic areas and try to always mop your kitchen floor. It just keeps things fresh and clean. A quick wipe down of the sink and toilet before you leave for work or school run in the morning – just keeps things clean and smelling good. 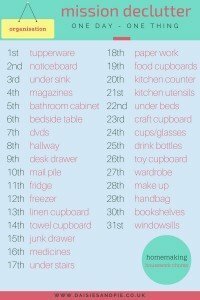 I think you’ll also like our MISSION DECLUTTER this will blitz through the clutter easily and get your house feeling fresh and organised!